"Sanctuary Vets love working with AMA, mainly because of the phenomenal support and enthusiasm that is offered by Haley. We are a family run business surrounded by corporate veterinary practices which have big marketing budgets. Haley offers an affordable advertising plan, that gives us opportunity to work alongside other small businesses. We also have means to communicate directly into the community which is very much our client base and Haley always contacts us when there is a story or an event that needs professional advice and/or articles to support said story I would not hesitate to recommend Haley and AMA on the grounds of support she gives and the affordability to speak directly to the community and potential new clients." 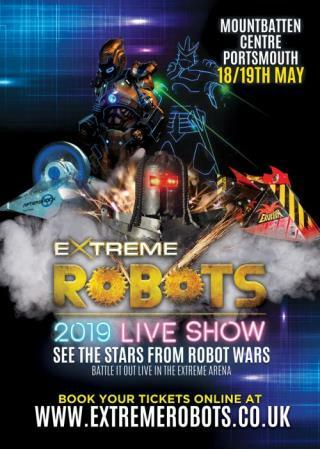 The stars of Robot Wars, have left the safety of the TV studio to enter the Extreme Arena. Who will rise and who will fall? AboutMyArea has been running in Portsmouth since 2006 and is managed by Portsmouth born and bred resident, Haley Storey. Established and popular, the site attracts thousands of visitors every week from in and around Portsmouth. Get in touch at portsmouth@aboutmyarea.co.uk.